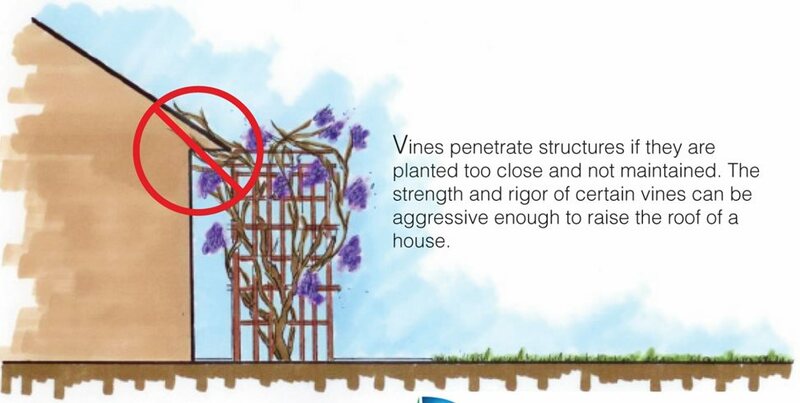 Vines that produce slender runners can penetrate gaps in a structure. As they grow thicker, they can cause severe damage. 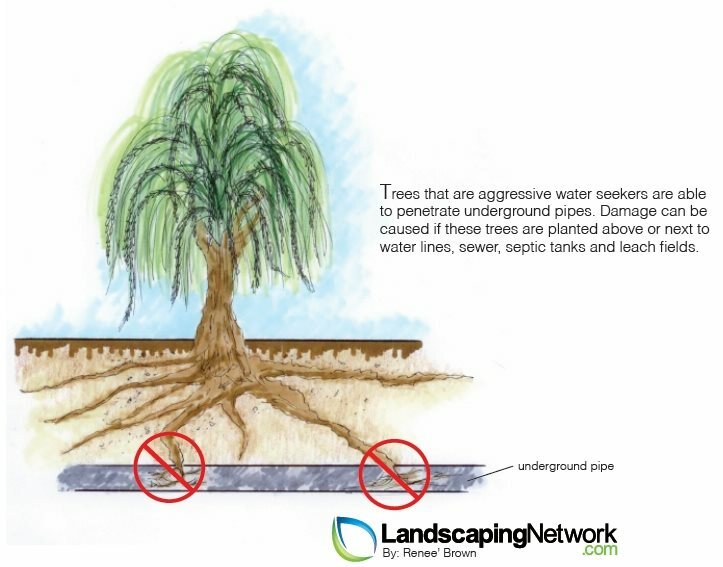 Trees or shrubs planted above water lines may penetrate gaps in underground pipes. 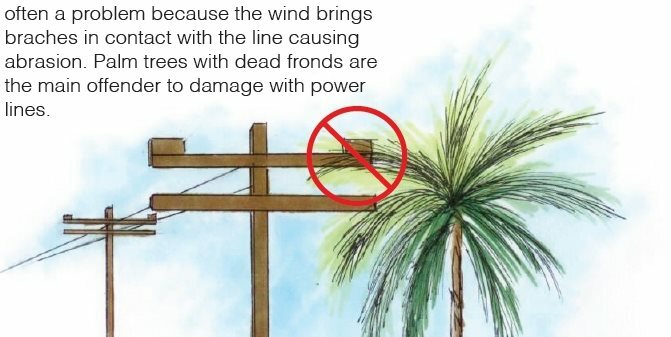 Palm trees with dead fronds near power lines can cause problems. 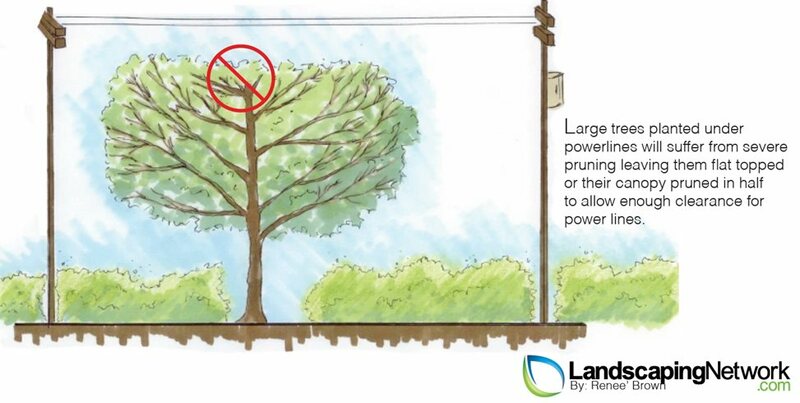 Avoid planting large trees under power lines. Be respectful of property lines when selecting plants. 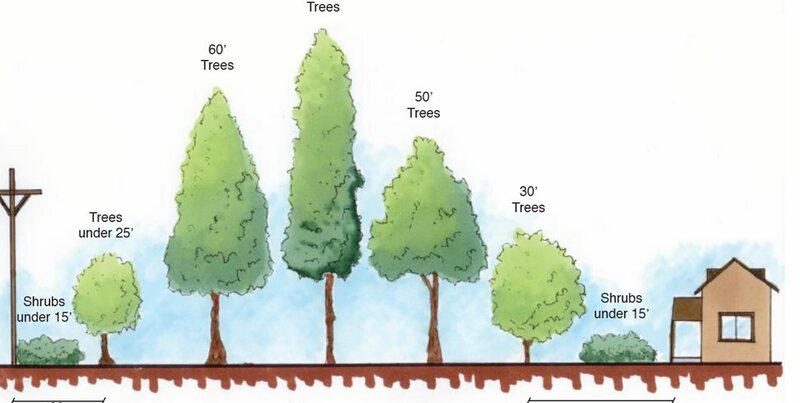 Make sure trees are planted at a suffucuent distance from patios and walkways. Guidelines for where to plant small, medium and large plants. 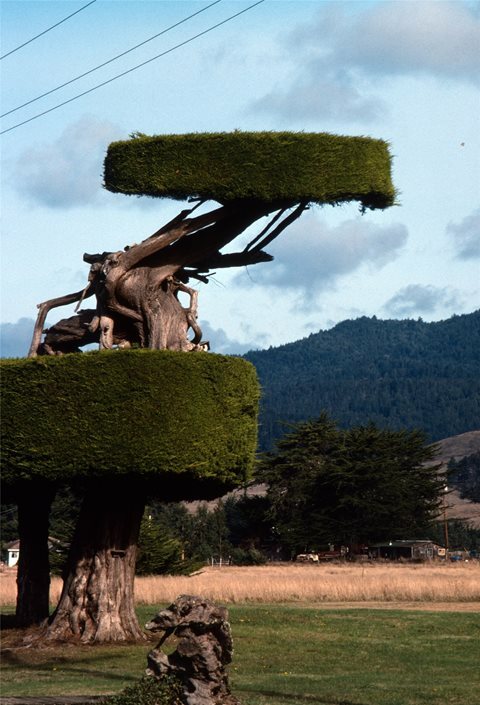 This cypress was first cut to clear power lines but the owner has since turned the mutilated form into an attractive topiary. This tree seeks moisture trapped beneath the adjacent paving and will soon lift it as roots increase in size. 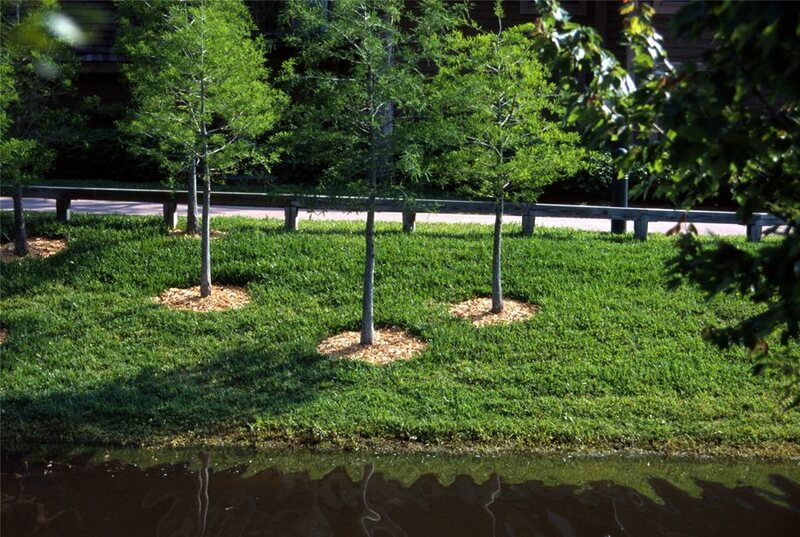 Trees in lawns produce surface roots that compete with the turf for water, but when root guards are installed at planting time they will go deep from the start. In a residential landscape, there will be mistakes. Some of these are related to construction and appear immediately, but others don't present themselves until many years later. The majority of these are related to plants which can become problems as they mature. An innocent little sapling can indeed become a destructive monster ten years later. Such mistakes can be enormous and very expensive to resolve. Landscape architects fear the potential law suits they cause. So to free yourself from the most costly repairs and even the prospect of litigation, avoid the following five bad planting ideas. There is nothing more beautiful than a front porch dripping with long lavender wisteria blossoms in spring. But one home engulfed with this vine literally had its roof raised by the pressure. This is one of the vines that produces slender runners that are adept at penetrating the tiniest slots and gaps in a structure. Runners gradually grow thicker over time, and harden into woody branches. A thin runner that penetrates a gap in your eaves will increase in diameter with each new season. When it exceeds the allowances of the space this plant is strong enough to pull nails out of lumber raising up a roof joist a few millimeters every year. 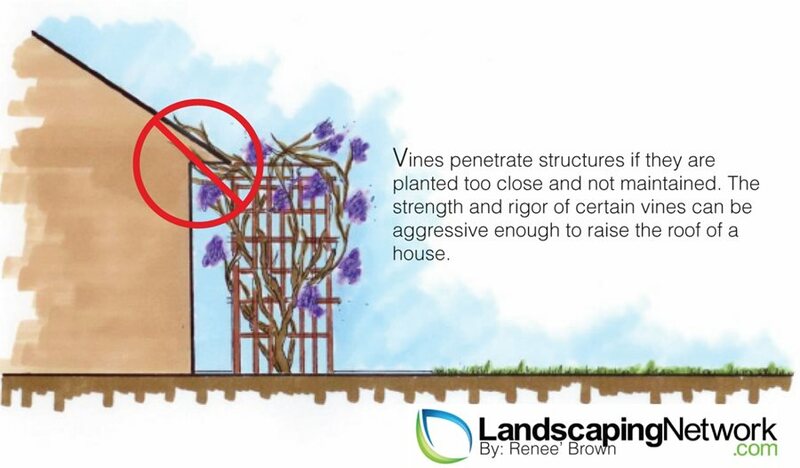 This example doesn't mean you can't enjoy wisteria, it just means that you must be attentive to its adventurous growth and cut it back enough each year to reveal any penetration. The same applies to English ivy which also reaches large diameter with time. If you are not willing or able to give your vines this kind of attention, then it's best not to plant them. Pro Tip: Vines allowed to grow up tree trunks into the canopy can kill their host. Those that climb telephone poles can be very expensive to remove. A good rule of thumb is "Never allow your vines to grow beyond the reach of your ladder. When the toilet won't flush and the kitchen drain clogs up, chances are you have roots in the sewer line. This problem can arise from trees and shrubs planted on or next to water lines, sewer, septic tanks and leach fields. 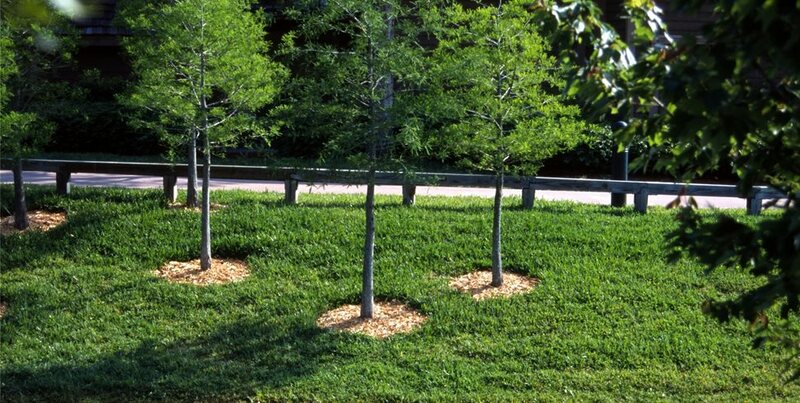 While all trees are water seekers, there are two groups that are the biggest offenders: water lovers such as willow and drought tolerant species such as locust. 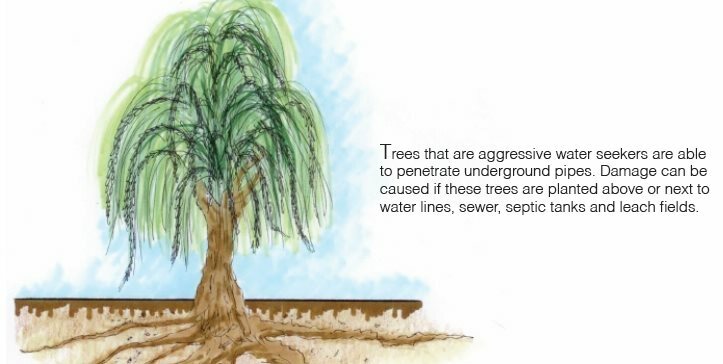 Willows and their kin produce a vast network of fine roots designed to hold banks of rivers, and these are the most able to penetrate the tiny gaps in underground pipes. Drought tolerant species evolved large and aggressive root systems able to travel a great distance and to surprising depths to reach water in their arid homelands. Both groups are excellent water sensors and always root directly toward any regular source. It's always wise to know exactly where all your underground utilities lie on site. This includes underground electric, phone and cable because these must be accessible for future service. If there is a large shrub or tree growing on top of the line, replacement or repair is next to impossible without damaging or even killing the plant. Keep woody plants well away from all utilities to save you plumbing problems and replacement dilemmas when things go awry in the future. 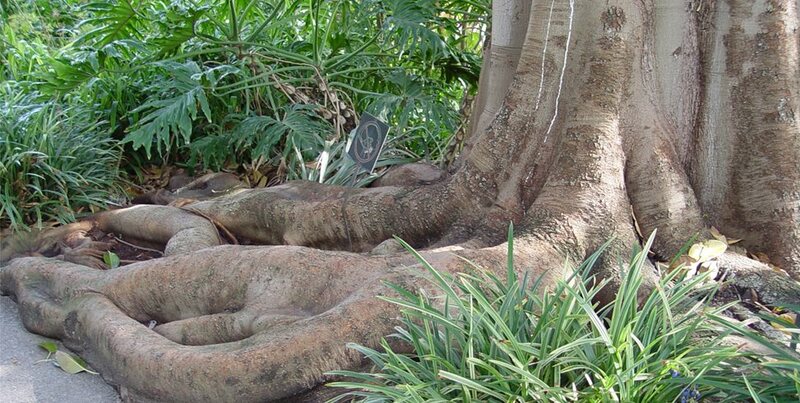 Pro Tip: Trees considered fast growing often produce aggressive roots to feed all that new growth. Most power companies advertise their mantra: Don't Plant Under Power Lines. They must budget tremendous amounts of money each year to have old established trees pruned back due to interference. 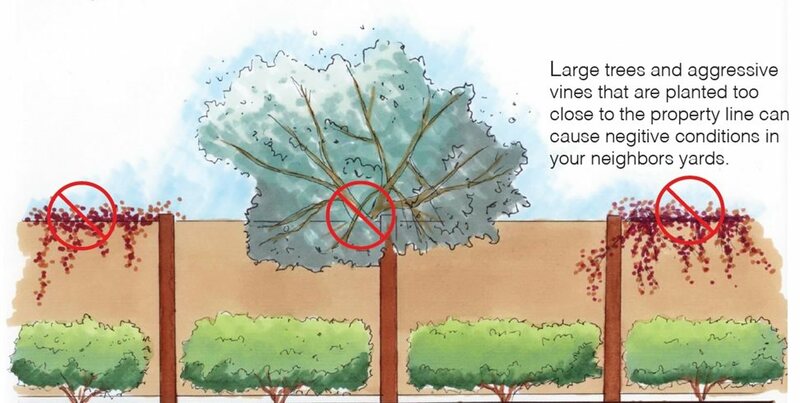 If they don't prune them, there is always a threat that your trees may cause damages that could end up costing you plenty. Also be fully aware of utility easements on your property which are provided in the event that overhead lines are one day undergrounded. Trees on or at this easement will be destroyed should this change occur. Abrasion is one of the key causes of damage to power lines, which is caused when wind moves tree branches back and forth where contacting the wires. This gradually wears away the insulating cover to eventually expose twigs to the bare copper wire. This can cause a short that can blow up a transformer or start a fire. 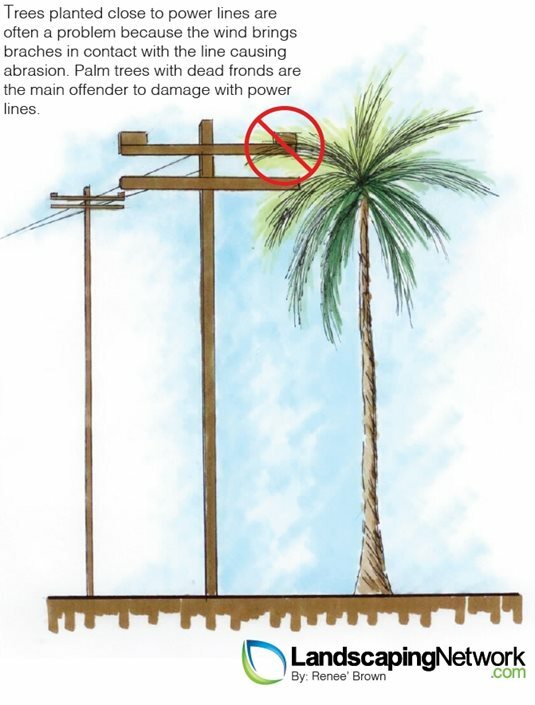 The primary offenders are palm trees with dead fronds that contact the wires or poles. Even the slightest spark can lodge in the dry tinder of a palm and set it on fire. If overhead utilities exist on your site, make sure your planting is well away from the lines. This requires a knowledge of how large a tree will be at maturity to ensure there is enough clearance. 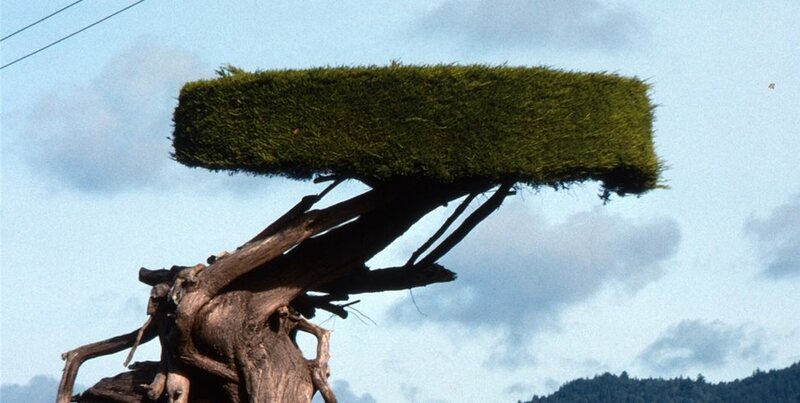 Otherwise you will suffer the tragic practical pruning of trees that leaves them flat topped or the canopy cut in half to allow lines to travel through unencumbered. 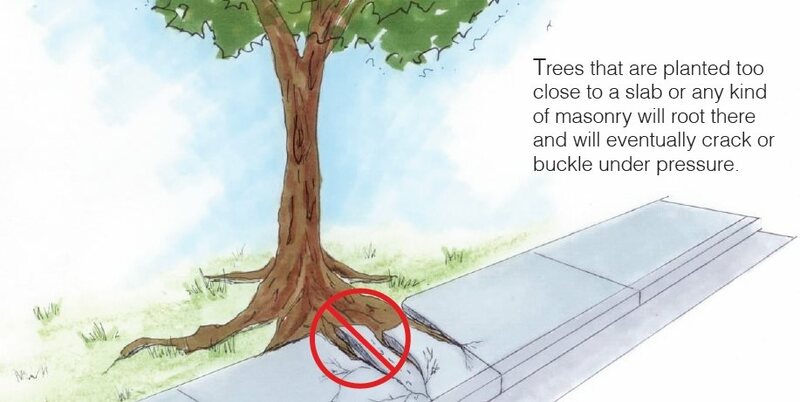 Anywhere you have paving, foundations, curbs and other forms of masonry, consider how close the trees are to these elements. Masonry tends to trap moisture in the soils beneath a concrete slab, for instance. Trees located near that slab will try to root there to access the cool damp conditions in the heat of summer. Year after year they continue tapping into this resource, and like vines, grow larger in diameter. The result is inevitably pressure upon the masonry, no matter what kind it is, and soon it will crack or buckle under the pressure. Not only do you want to set the tree or large shrub back from the masonry, be sure to select a tree that bears a well-behaved root system. City street tree lists are often the best source of species screened for local adaptability and a lack of aggressive rooting. 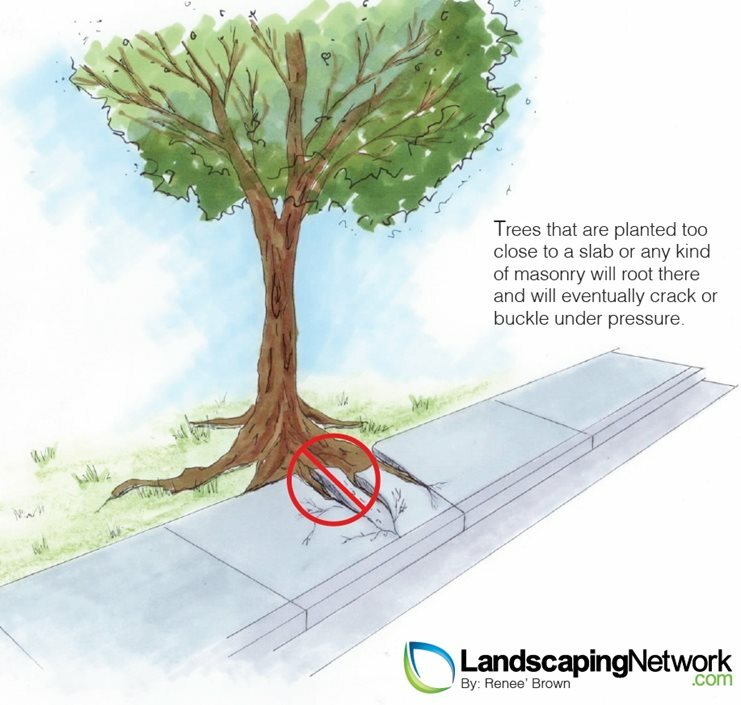 If there's no way to avoid placing a tree near masonry, install a root barrier product to separate roots from masonry underground. This device works with newly planted container root ball, preventing it from branching out horizontally so growth is forced downward, to reach deeper soil moisture. Large trees, shrubs and vines on property lines are the bane of city public works and the money makers for lawyers and tree trimmers. 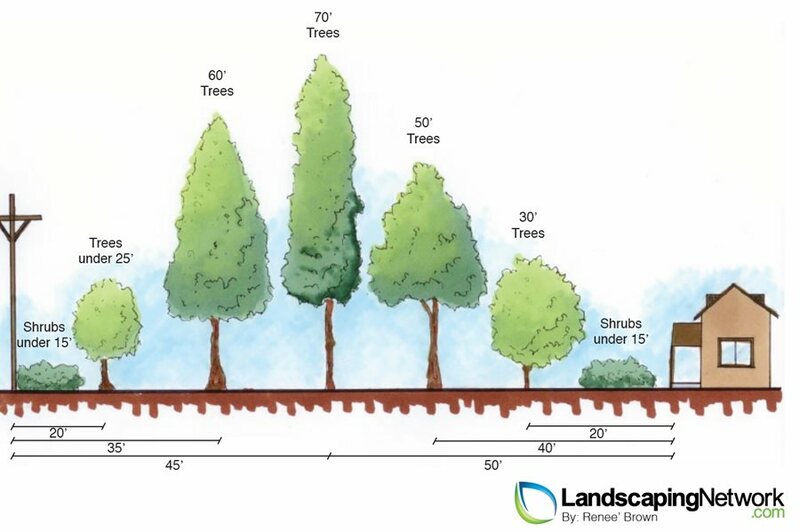 The potential size of a large tree at maturity is enough to negatively influence conditions in your neighbors' yards. It may shed litter, produce hazardous branches, send roots under the fence to invade the lawn, and present a dozen other common problems that crop up on property lines. And if your neighbor has a swimming pool, consider this doubly important. To preserve your next door relationship and avoid litigation, keep shade trees well inside your lot. 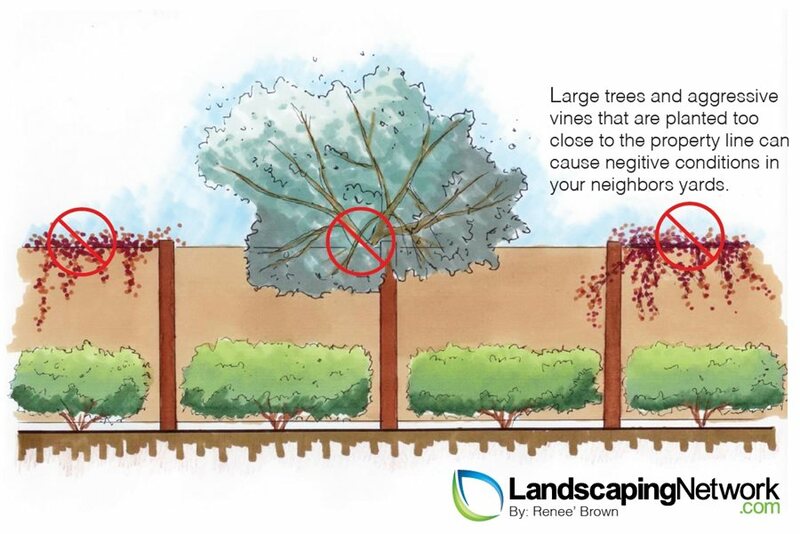 Avoid invasive vines on perimeter fences and walls because inevitably they'll find conditions more to their liking next door. If your neighbor is not a lover of plants, this results in serious conflicts. Where there is a situation of liability present, such as a dangerous overhanging limb that could fall on a person or vehicle in the next storm, the cost to remove it can become a bone of contention since this can require a cherry picker or other special equipment if access is limited. If you fail to correct this and someone is hurt, you may find yourself in court accused of negligence. Getting plant selection and placement right from the beginning will help you avoid major headaches and costly repairs. 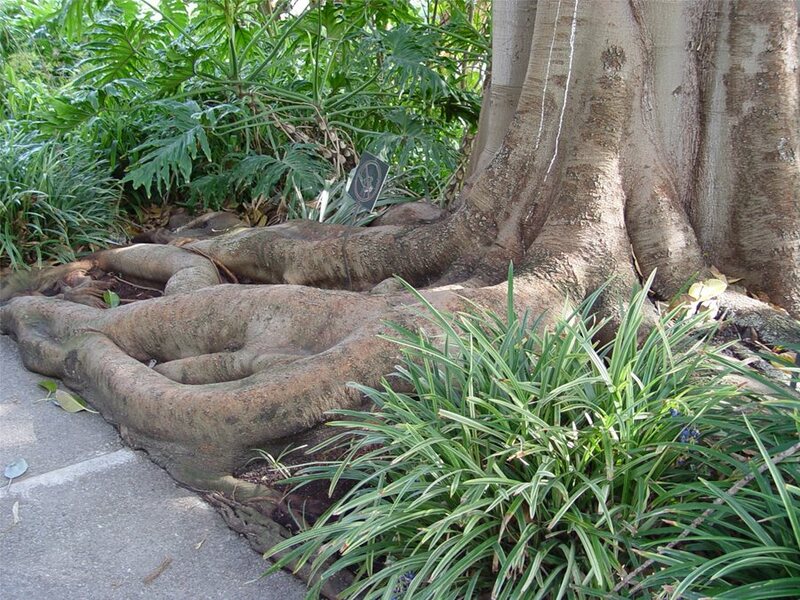 Vines and trees with aggressive roots are examples of plants that can mature into problems. You can avoid planting mistakes by knowing the growth habits of the plants you select, as well as their mature size. Don't be afraid to ask your designer about this especially when it comes to plants that will be growing near your homes eaves, underground utilities, power lines, masonry work, or property lines. Do you love learning about plants? Then you will enjoy Garden Design magazine—the quarterly magazine for design-conscious readers!